Custard Corner has been serving customers from Buffalo’s West Side, Downtown, all over Western New York & Ontario for over 30 years! 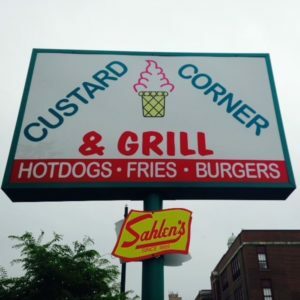 Custard Corner was established by Peter & Mary Elia in 1983 and taken over by current owners, Michael & Rene Wolasz. The story began in a very small corner building on Porter Avenue & Fourth Streets in Buffalo, NY. At that time it was a simple Custard Stand on the West Side across the street from Ted’s Hot Dogs. A family operated business just serving French Vanilla, Chocolate & Twist Custard along with some sprinkles and a few sundae toppings. News quickly spread and that little corner ice cream shop turned into a summer hot spot soon to outgrow its space. In 1992, the current location was built adding several additional tasty treats along with a deli. For over 10 years, the deli business did great but customers were always asking for hot food. Therefore, this year (2014), Custard Corner was remodeled inside in order eliminate the deli section and add the grill allowing for delicious new hot items. Currently serving all the usual tasty Custard & Ice Cream treats you’ve grown to love along with a new hot food twist. We are a family oriented outdoor seasonal restaurant serving up grilled favorites and delicious custard and ice cream treats. We have plenty of outdoor seating to enjoy your picnic lunch/dinner or dessert on a gorgeous Buffalo summer day. However, on those rainy days or for those with busy schedules, we feature call ahead and takeout orders. Our location is on the West Side of Buffalo near the Peace Bridge Plaza, Olmstead’s Front Park, D’Youville College & West Side Rowing Club. We are walking distance from LaSalle Park, less than a mile from Downtown Buffalo via Niagara Street and a close bike ride from the Elmwood Village Neighborhood. Serving the highest quality French Vanilla & Chocolate Custard by Upstate Farms. We use the French Vanilla Custard to make our delicious Strawberry Custard. Flavors available twisted as Chocolate/Vanilla Twist or Strawberry/Vanilla Twist. **We are sorry but we do not offer a Chocolate/Strawberry twist. 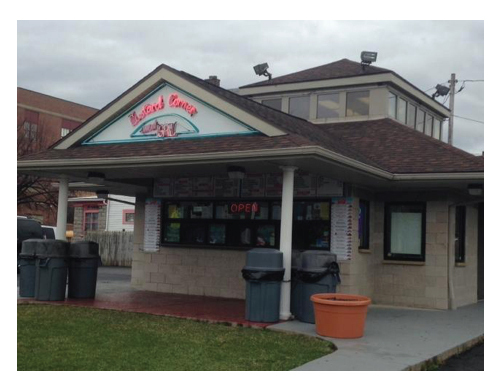 Serving Western New York’s very own Perry’s Ice Cream, and offering some of your most favorite flavors! We always carry the following flavors: Maple Walnut, Butter Pecan, Cookies and Cream, Strawberry Cheesecake, Pistachio, Black Raspberry, Mint Ting-A-Ling, Fat Free Sugar Free Raspberry Swirl or Butterscotch Swirl & Rainbow Sherbet. We always run a lowfat yogurt flavor as well. 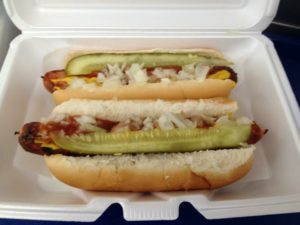 Serving Western New York’s very own Sahlen’s Hot Dogs! A local favorite for over 145 years! Enjoy a delicious hot dog grilled to perfection – alone or in a combo! Kid’s meal is made with a tasty Sahlen’s skinless hot dog [just the right size & no peeling needed].